It has been a solemn few days for me. When I returned from our vacation, I found out that one of our friends from church – their son died in a tragic accident. He was hit by a out of control car. He was only 21 years old. I always had a heart for this kid. He reminded me of me when I was his age – grew up in church, but was no longer interested and going his own way. His mom is my children’s preschool teacher and I would often ask her about her son and how he was doing. She always spoke about him with a loving heart but also sad over the decisions he had been making. I used to remember the terrible things I did to my own parents during my time of rebellion and I would pray for this boy that he would someday come back. I was devastated to hear that he had passed away. I went to the wake and there were hundreds of people young and old grieving together. I stood in line to hug his parents and express my condolences. His mom cried on my shoulder and both her and her husband talked about how they knew I had prayed for him and how they so appreciated those prayers. I then think about my own children and the possibility of them dieing. I hate to think this way, but what if it happened to me? Life is so uncertain. 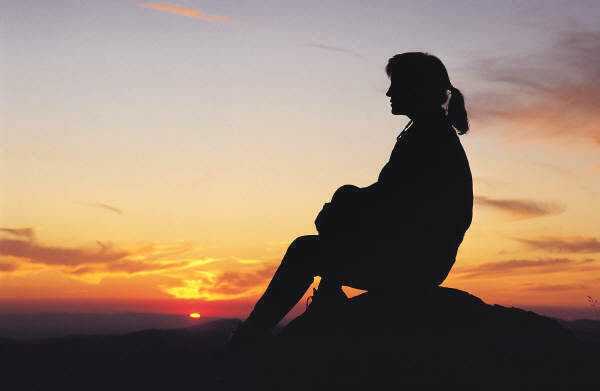 So many people in my life who I am aquainted with – friends, family, even internet connections – many have gone through terrible loss. Over the past few days a fear has immerged within me that I know comes from the devil himself. A fear of losing my husband or even my children. I have thought about it over and over again. And I am writing about it so that I can get it out and be free of it. I know that it isn’t healthy for me to do this. There are a lot of verses in the Bible that talk about fear. So, I decided to do some research and came up with 2 really great scriptures that I am going to memorize and bring to mind whenever this tries to bring me down over the next few weeks. The title of this post is “Contemplation on Life’s Uncertainty”. As human beings, we can get stuck in fear of the uncertainty of life. We can waste time focusing our thoughts on the negative things that COULD happen in our lives and the lives of those close to us. But this type of thinking can hurt and destroy us. We need to change our thoughts and focus on the positive. Worry can grip us and for some it can be VERY hard to get out of. But worry is wrong. It is the opposite of trust. God wants us to put our trust in Him no matter what our circumstances. So, I encourage you to join me in this fight against negative thinking. Many of us carry unbearable emotional pain and the devil is using it to destroy us. Let’s step out in faith and become conquerers for the sake of Christ. His love with carry us through this. I know that many of you (my readers) have faced death, maybe even the death of a child. I would love to hear from you and how you have overcome. Did you question God? Did you get angry at God? Please share. My grandma (otherwise know as GiGi, short for great grandma) passed away recently.? She was 94 years old.? It was a difficult time for us.? We all went to stay with my mom to help prepare for the funeral.? My grandma lived with my mom for her last couple years, so the kids did notice that she wasn’t there when we went to visit.? They asked for her a lot and it was a challenge trying to explain to them that she wasn’t here anymore – that she was in heaven.? My daughter asked me if we could go to heaven to see her.? It was sad and cute at the same time. The one issue I was having was whether or not to bring them to the funeral service.? We decided to take them and just keep them in the back of the church for the service.? What we didn’t realize is that the funeral home brought my grandmas body into the church AFTER we had gotten there.? They wheeled the casket right by the kids from the back of the church to the front.? I was a bit upset and I it looked like my oldest (4 1/2) was in shock.? The funeral directors opened the casket before wheeling my grandma up to the front.? So from a child’s perspective it must’ve looked pretty odd to see her inside this big box being wheeled around. On top of everything, I was nervous because my brother and I were doing the eulogy.? So all I could do was quickly explain to both my son and daughter, again, that Gigi (pronounced JiJi) died and that her body was sleeping and whatever else came to my mind at the time. After the funeral, we got caught up with family, the catered luncheon, and taking pictures with family that we hadn’t seen in years.? The kids forgot about it and I was too exhausted to bring it up.? I decided to wait on them to ask me questions if they needed to. It has been a few months now.? We have been back to my moms since the funeral and the kids have moved on.?? How quickly children can recover and forget.? But do they really forget? Well, a couple weeks ago I found both of my children sitting next to eachother talking quietly watching a doll that they had carefully laid out on top of my daughter’s crib.? 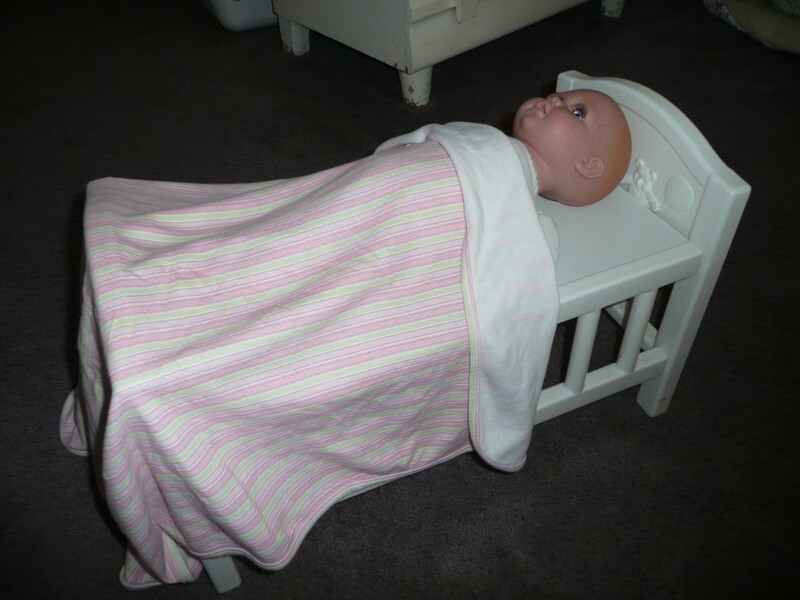 They turned the crib over and then laid a blanket over the doll. ? I asked them what they were doing and they explained to me that the doll had died.? It was so adorable, but yet so sad.? I took a picture of what they did.? 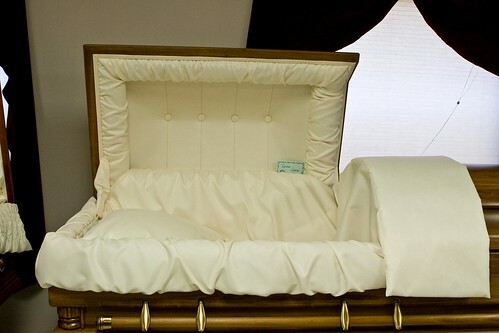 It really looks just like my grandma did when she was in the casket.? Kids are so smart aren’t they? Have any of you moms had to deal with this type of situation yet?? If so, how did you handle it? Don’t forget to enter my current Giveaways!!? Click on the links!